SANTA MONICA, CA – In this day and age, finding an effective way to market a product is more paramount than ever for companies that have a lot riding on their bread and butter. Recently, you’ve probably seen the new Coca-Cola cans and bottles that try to get people to buy an extra soda by “Sharing a Coke,” with their friends and family. Of course, the names are randomly added to the packaging, but it’s the jolt of excitement when you find yourself or someone you know emblazoned on the front of a Coke bottle that gets the upsales. Instead of buying only one Coke, or none at all, people think it’s kinda funny or cool to see their name, and they totally are gonna get a bunch of likes for it on Facebook or Tumblr, so the transaction is made. It’s worked quite well, as if Coke needed help selling, but that sort of personalized marketing has caught the eye of the Coca-Cola of gaming: Activision. Robert Kotick, current CEO of Activision, held a quiet press meeting in his 16-car garage on Wednesday, where he gathered big wigs from several global advertising agencies, television broadcasting giants, and really important video game journalism websites to discuss a very unique direction for the distribution of the upcoming Call of Duty: Advanced Warfare. Immediately after, Kotick pulled out a magician’s hat, and inside of it was the first ever customized Advanced Warfare box art. It was the same cover that we’ve seen before, but I felt something strange come over me. 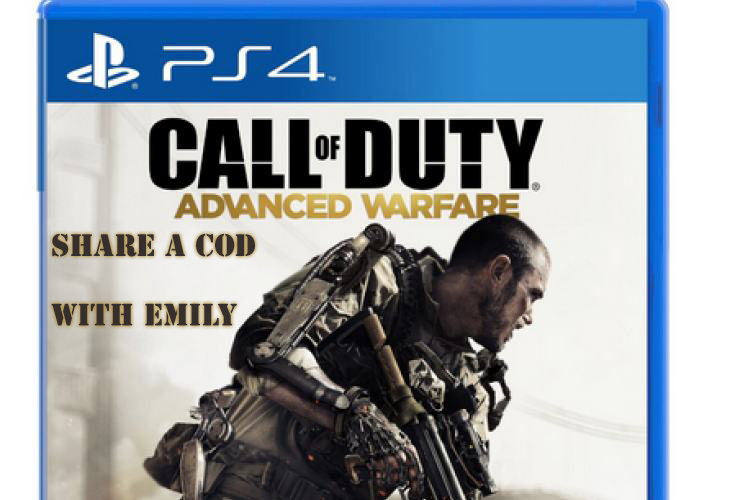 The box said, “Share a CoD with Emily.” My sister’s name is Emily. I wanted to buy the game for her so we could play together. I wonder if they’ll make one that has my name on it…I’d love that!